While loose, sagging, and excess skin in the upper arms may develop as a result of natural aging or genetic factors, this condition is particularly prevalent in people who have lost a substantial amount of weight. For many people, excess fat and flaccid skin in the upper arms cannot be eliminated and toned through diet and exercise alone. Some people forego fashionable attire and bathing suits in order to hide their upper arms with long-sleeved clothing. In a small number of patients, excess arm skin can also cause physical problems, including chafing, rashes, and skin irritation. An arm lift, or brachioplasty, is designed to give you firm, attractive, well-defined arms by removing excess skin and fat. In some cases, arm lift surgery can be combined with targeted liposuction to improve overall contours in the upper arm and surrounding areas. Dr. Levine offers a full range of advanced arm lift procedures that can be customized to your specific needs. People with excess skin and localized fat in the upper arms — either caused by aging, genetics, or significant weight loss — may be good candidates for arm lift surgery. Arm lift surgery is ideally performed after you have achieved your weight loss goals and reached a plateau. If you are continuing to lose weight, you should wait before having arm lift surgery. Dr. Levine will gladly meet with you to discuss whether you are a good candidate for arm lift surgery. 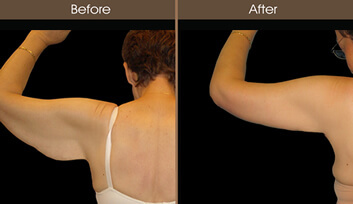 Arm lift surgery addresses excess skin and fat in the upper arms. During the arm lift procedure, localized fat may be removed through a combination of surgical excision and liposuction. Excess skin will be trimmed and re-draped to improve arm contours. Where do you place incisions for arm lift surgery? Can LazerLift® be used for arm lift surgery instead of traditional incisions? In some cases, LazerLift® can be used during arm lift surgery, allowing for modest improvements without any incisions and virtually no scars. This technique utilizes advanced laser technology, as opposed to scalpels, to reduce fat and tighten skin. LazerLift® offers additional benefits as well; the production of collagen is stimulated, allowing for skin tightening to continue even months after the initial procedure, and ThermaGuide™ real-time temperature feedback self-regulates the laser, allowing for natural-looking results without damaging surrounding tissues. * Ideal patients for this technique display minimal to moderate skin sagging. Dr. Elie Levine can evaluate your individual problem area and help determine whether LazerLift® can be utilized during your arm lift surgery. Absolutely. Arm lift surgery is often combined with other procedures, such as breast lift, breast augmentation, breast reduction, liposuction, thigh lift, and facial rejuvenation. Dr. Levine will discuss with you which procedures or combination of procedures may best suit your specific needs. During your initial consultation, Dr. Levine will examine your upper arms to determine the fat distribution, as well as the amount of excess skin present. He will also address your medical history and discuss other factors that may affect arm lift surgery, such as previous surgeries and history of weight fluctuations. He will thoroughly discuss your goals and expectations, including possible risks and the best way to prepare for your surgery. He will let you know what to expect before, during, and after your procedure, and he will answer any questions that you may have. We recommend general or twilight anesthesia for arm lift surgery. You will discuss your procedure thoroughly with both Dr. Levine and our board-certified anesthesiologist to determine the best type of anesthesia for your needs. What can I expect during arm lift surgery? Arm lift surgery is usually performed on an outpatient basis in our state-of-the-art, in-office operating suite, which is accredited by the American Association for Accreditation of Ambulatory Surgery Facilities (AAAASF). The length of your procedure will depend on many factors, but on average, the procedure usually takes 2-4 hours. * After your procedure, you will wake up in our warm and caring recovery suite, where our licensed, registered nurse will make sure you are comfortable and assist in your recovery. You will be able to go home the same day with a friend or family member. Every surgery is different, and you will receive detailed post-operative instructions for your specific needs. In general, you can expect to have swelling in the arms for 1-2 weeks after surgery. Most patients report mild to moderate pain after the surgery, which is usually well-tolerated with medications. * At Plastic Surgery & Dermatology of NYC, our concern for you doesn’t end when you go home. We’re dedicated to providing ongoing care to ensure a fast, safe, and smooth recovery. Dr. Levine will see you for post-operative visits, and he and our staff stand ready to answer any questions you may have about your recovery, as well as your overall health and well-being. Is there a minimally invasive alternative to arm lift surgery? Absolutely. We offer BodyTite™ to simultaneously remove small deposits of stubborn arm fat and tighten loose skin using radio frequency energy. The arms are one of the more difficult areas of the body to firm, as the skin around the arms is thinner than most other areas. BodyTite™ can carefully and efficiently tighten loose arm skin and reduce unwanted fat for slimmer-looking results. Dr. Levine can discuss if BodyTite™ treatment is an ideal alternative for you during your arm lift consultation. Dr. Elie Levine will be happy to meet with you to discuss arm lift surgery. Please call our office at 212-988-1800, or make an appointment online for a personal consultation in our New York City offices.